Home Food Corner TWO PRESIDENTIAL CANDIDATES DROP THEIR AMBITION TO SUPPORT PDP's ATIKU ABUBAKAR. TWO PRESIDENTIAL CANDIDATES DROP THEIR AMBITION TO SUPPORT PDP's ATIKU ABUBAKAR. 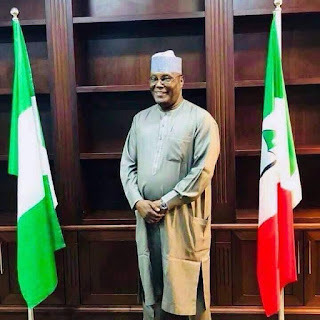 Two Presidential Candidates from two political parties have stepped down their ambitions to support the Presidential candidate of the People's Democratic Party, PDP, Alhaji Atiku Abubakar. The candidates, Nicolas Felix and Barrister Chuks Nwachukwu, both of Peoples Coalition Party, PCP and All Grassroots Alliance, AGA announced their endorsement of Atiku Abubakar at a Press Conference in Abuja. The News gathered quotes the two candidates as saying that the candidate of the PDP has demonstrated sufficient expertise and willingness to address the various challenges facing Nigeria. Nicolas Felix particularly expressed optimism that Atiku would make the nation work again if elected since he has all that it takes to develop the country. “After careful consideration and several meetings among some presidential candidates, I Dr Nicolas Felix the presidential candidate of Peoples Coalition Party (PCP), together with Barrister Chucks Nwachuku, the presidential candidate of All Grassroots Alliance (AGA), are officially and enthusiastically declaring our support for the presidential candidate of the Peoples Democratic Party, PDP, Alhaji Atiku Abubakar. “On this note, we are urging all our supporters and millions of youths across the country on February 16th 2019 as they go to the polls, to vote for Alhaji Atiku Abubakar. “Under him (Atiku), our power sector would deliver not only to the few, but every citizen of this great country. Under him, we can have a restructured Nigeria where the opinions of all would be heard and examined without being marginalised. “Under him, the lives and properties of Nigerians would be secured irrespective of their origin, religion and ethnicity. “Under him, we can be sure that our infrastructural development and critical sectors would be upgraded to international standard,” he said. Speaking also, Barrister Nwachukwu said: “As has been the case throughout our history, in the name of fighting corruption, we have been served in the past four years like prisoners in our land, the odious meal of destruction of our institutions through nepotism and inflection of institutional culture to achieve narrow, malicious ends. “The Judiciary, the most sacred of our institutions, has been the latest victim- stripped naked of its dignity and self-confidence in the market square.